Before you start reading, please note that this review is based on the general release version of the film rather than the so-called "international version" shown at the Cannes Film Festival. 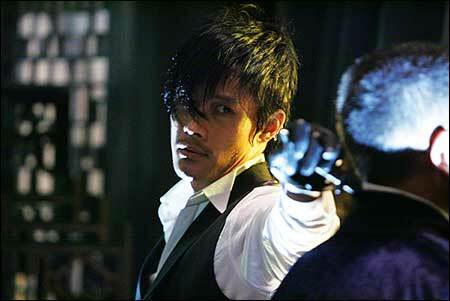 Chang-yi (Lee Byung-heon), a dandy hit man with a perpetually bemused, go-ahead-call-me-a-psycho grin on his face, is hired to retrieve a certain map in the hands of a Japanese banker. Unbeknownst to him, meanwhile, bounty hunter Do-won (Jeong Woo-sung) is sent by the Korean independence army for the same mission. To their irritation, however, the map is snatched by the train robber Tae-gu (Song Kang-ho), who is convinced that it leads to the fabled treasures of the fallen Qing dynasty. Kim Ji-woon, who has an impressive track record of having successfully tackled a wide range of genres, from sports comedy ("The Foul King") to horror ("Tale of Two Sisters") and European-style film noir ("Bittersweet Life"), now turns his sight on the western. As one can surmise from the title, the movie is intended as a conscious homage to Sergio Leone's Eastwood triptych. Like "Bittersweet Life," which invoked the cool, nonchalant exterior and existentialist attitude of a Pierre Melville rather than the original American film noir, "The Weird" passes over the concerns and themes of classic westerns (individual freedom vs. commitment to community, and so on) and focuses on the stylistic vocabularies of the genre. Viewing "The Weird" is, in other words, a lot like watching a witty pastiche of great westerns rather than a great western itself. Perhaps I am overly harsh with Kim, who might have never intended his film to be anything more than an affectionate send-up to the mythic grandeur and marvelous vistas writ in a Leone film. He certainly knows how to entice his viewers with visual language, staging complicated shootouts and tense mano a mano duels with the aplomb of a master stylist. From the opening credit sequence with gliding birds of prey trailing the names of the cast like ID tags, to busy shootouts in the rain-drenched marketplace, in which a "Robot Monster" like diving helmet finds an unconventional usage, to the final confrontation that exactly copies the Leone original's set-up but going for a typically bloody, excessive resolution, Kim and his technical staff (cinematographer Lee Mo-gae, production designer Jo Hwa-seong, and composer Dal Pa-ran) are fully in control of the film's aesthetic and technical elements. The film's main weakness is the screenplay. Granted, Leone's works don't exactly have Oscar-caliber dialogues or entirely sensible plots (although some fine directors like Bernardo Bertolucci and Dario Argento have been involved in writing them), but Kim Ji-woon and co-scribe Kim Min-seok fumble in throwing the three main characters in sharp relief, either as archetypal, mythic beings (this is something Leone and his writing team excelled in, even though it had very little to do with the real, historical "west") or as sympathetic flesh-and-blood characters. I have had problems with Kim Ji-woon's lack of control over the narrative flow and resolution of "Tale of Two Sisters" and "Bittersweet Life" before, but at least I was willing to defend their characters as worthy of emotional investment on the part of the viewers. I am not so sure about "The Weird," even though Lee Byung-heon and Song Kang-ho still provide plenty of entertainment value, relying on their patented tools of the trade. Jeong Woo-sung by default leaves the weakest impression, although it is not really his fault that he sounds like a guy from an outdoor sportswear commercial. As for the claim that the movie marks a departure from nationalist orientations of other Korean films, sure, Song Kang-ho does mumble something about how the yangban aristocrats and Japanese colonizers are hardly different from one another as rulers, but it really has nothing interesting or worthwhile to add about Manchuria as a multicultural, potentially subversive (fictive) space. 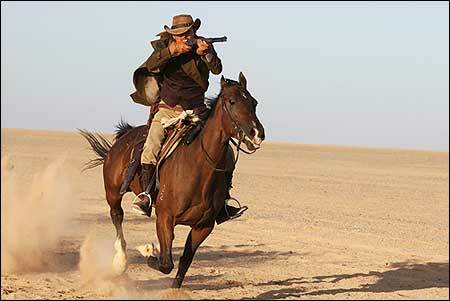 In the end, "The Weird" reduces Japanese opponents (along with Chinese bandits) to straw figures to be mowed down, especially in the extended "My Name is Nobody" meets "Road Warrior" climax in which Jeong Woo-sung (actually, his stunt double) gets to play the hey-look-ma-I'm-Steve-McQueen trick reloading his rifle. 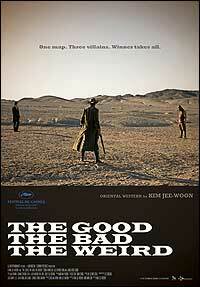 "The Good, the Bad and the Weird" is, all things considered, quite entertaining and Kim Ji-woon's reputation will not be sullied by this latest exhibit of "Manchurian western," (a genre that has a checkered but surprisingly long history in Asian cinema) if not significantly enhanced. I must confess, though, that my (perhaps unrealistically high) expectations about it were not met, except in the gorgeous production/cinematography department.